This time last year Bolton travelled to Stamford Bridge to face an undefeated Chelsea. As we all know on that particular day it was the visitors that went away with the three points. It ultimately lead to our title challenge and us having a rocky period during December and January. Today it was the visit of Newcastle in a 12.45pm kick off, it was only just under a month ago that we’d travelled to St James Park to face them in the Carling Cup, that night we won 0-2 after extra time, thanks to goals by Eidur Gudjohnsen and Arjen Robben. Eidur had scored six goals in six games against Newcastle and today he was looking to better that record. Newcastle hadn’t beaten Chelsea at Stamford Bridge since 1986, last season they came and got a 5-0 battering, so could the same kind of punishment be dished out to the Geordies today? If we won then we’d go eight points clear of Arsenal at the top of the Premiership, they were playing Birmingham later in the day. Chelsea were finding it a little tough, neither Damien Duff nor Arjen Robben were getting into the game as the Newcastle defence and Lee Bowyer were breaking up the play. Newcastle then had another effort just before the half hour mark, a Bowyer through ball found Craig Bellamy who was onside but again it was Cech who saved the day. He came rushing out of goal blocked Bellamy’s effort and when the ball came back out it was hit over the bar. Chelsea’s first effort on goal came when Frank Lampard found Tiago; his swerving shot on target troubled Shay Given as he dropped the ball but easily regained it. Then just as the Newcastle defence were looking quite solid the best chance of the first half came on the 33rd minute. A ball rolled out to Bramble caught him a bit unawares; he then passed to Johnsen whose pass across goal was intercepted by Eidur Gudjohnsen. With only Shay Given to beat he tried to knock the ball over the diving keeper but the effort went just wide of the post. If Eidur had taken it around Given then it would have been 1-0, however it wasn’t to be. So the first half ended 0-0 and for part of the half Newcastle looked better and created the better chances. At the start of the second half Jose Mourinho took off Eidur and bought on Didier Drogba. Newcastle again started to dominate proceedings at the start of the half but it wasn’t to last too long. In the 55th minute a ball over the top found Didier Drogba, he bought the ball down beautifully with his first touch but he was too close to Given who snaffled the ball up. A few minutes later Newcastle got another effort on target with a free kick. Claude Makelele fouled Lee Bowyer 15 yards out, Lauren Robert stepped up again to hit a shot low and hard that Cech dived on and Makelele cleared for a corner. Jose then swapped things about in the 62nd minute mark, he decided that the 4-3-3 formation wasn’t working and changed to a more conventional 4-4-2, which isn’t a Mourinho trait. Off came Tiago for Kezman and William Gallas departed for Wayne Bridge. Gallas hadn’t got forward that much during the game so Bridge came on to penetrate the left hand side a little more. A minute after making the substitutions we went 1-0 up through Frank Lampard. A Makelele pass found the head of Didier Drogba who in turn found Frank Lampard in front of the goal and he buried his chance. 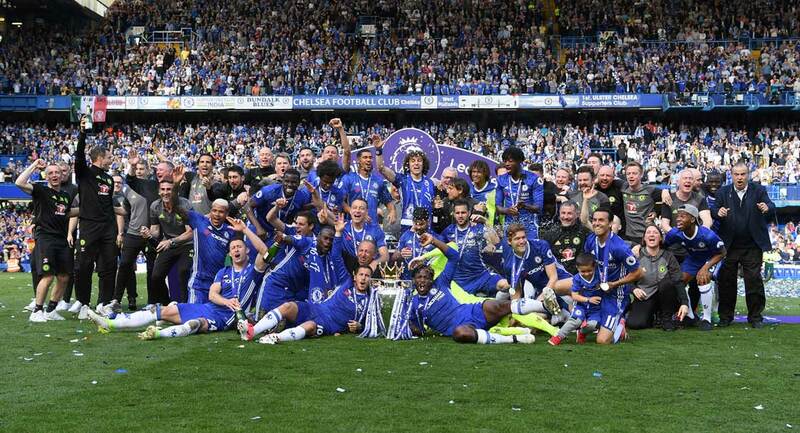 From there on in there was only one team in the game and it was always going to be Chelsea. After the first goal we began to control the game and Newcastle were made to look like the Darlington reserve team. Two minutes later Frank nearly got his second of the game, Robben played the ball to Kezman who found Duff who laid the ball back to Lamps, but his shot on target was saved by Given. It didn’t take too long and it was 2-0. Frank Lampard turned provider this time as he played a perfect ball from midfield, Didier Drogba ran onto it beat Titus Bramble and hit a low shot into the left hand corner of the net. This was Drogba’s first Premiership goal at Stamford Bridge this season and the game was all but over. Newcastle were now on the rack, in the 72nd minute Mateja Kezman had a shot that hit the post after great play by Robben and Duff. It was a shame for Kezman as he looked like he was going to get his first Premiership goal; he didn’t have to wait too long though. Two minutes from time Arjen Robben made it 3-0, Damien Duff broke and played the ball to Robben, he beat Lee Bowyer, cut inside Aaron Hughes and placed the ball past a helpless Shay Given. It was awesome stuff from Chelsea and it wasn’t over yet. Two minutes into injury time at the end of the game it was 4-0. Duffer got in behind the Newcastle defence went to go round Given but was hauled down by the keeper, referee Rob Styles pointed to the spot and who was given the opportunity to break his Premiership duck, Mateja Kezman. Kezza stepped up delayed a little ran up to the ball and sweetly chipped the ball into the net. It was a beautiful penalty; everyone in a blue shirt dived on Kezman and celebrated as one. Just as Newcastle kicked off, the final whistle blew. We had again thrashed the Geordies, it put us eight points clear at the top. It didn’t last long as Arsenal won their game 3-0 but it sets up a wonderful clash at Highbury next week. Firstly we travel to Porto on Tuesday for our last Champions League game in the group stages, what’s the betting players will be rested ahead of the Arsenal game, well I’ll go for 4/6 the same odds on Chelsea to win the Premiership, Arsenal here we come! 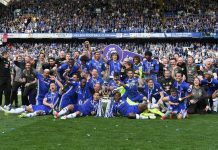 Chelsea: Cech, Ferreira, Carvalho, Terry, Gallas (Bridge 61), Tiago (Kezman 61), Makelele, Lampard, Duff, Gudjohnsen (Drogba 45), Robben. Subs Not Used: Pidgley, Parker. Newcastle: Given, Taylor, Bramble, Johnsen, Hughes, Dyer, Jenas, Bowyer, Robert (Ameobi 77), Kluivert, Bellamy. Subs Not Used: Elliot, Harper, Milner, Ambrose.